Oh yes. We’ll be making you again!!! And as you can see, we have yet again another sorta vague recipe. It leaves me wondering…How many chops?! Based on the fact that I doubled the celery and onion it called for and that was plenty for the 9 chops I had…I’m going with 4 chops for the original recipe. 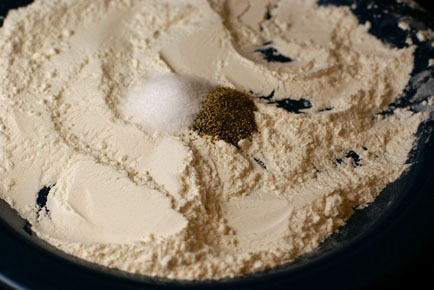 Place the flour with a little salt and pepper on a large plate. 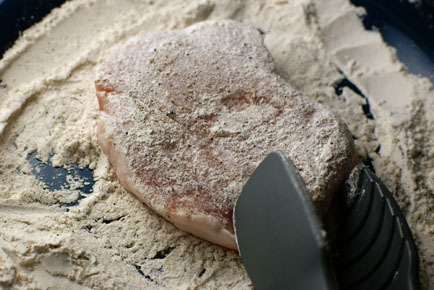 Dip the pork chops into the flour. Not quite the same thing as dusting. But it works. Place the dipped chops into a skillet with the oil. Brown for 2-3 minutes over medium high heat. Brown all the chops. If you are making more chops than can fit into your pan, remove the chops and repeat. I chose to bake the chops because I was making 9…and they all would not fit in my skillet to simmer. 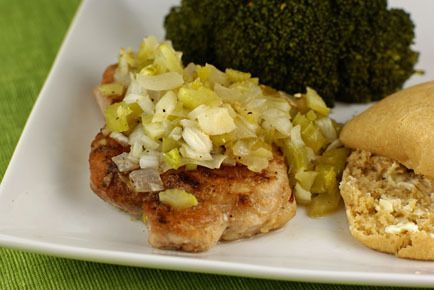 Chop up the celery and onions and toss with the olive oil and pickle juice. Browned chops go into glass baking dishes. These. were. oh. so. incredibly. delicious. They really had it figured out back in the 30s and 40s. This is post-depression cooking at its finest y’all!!! 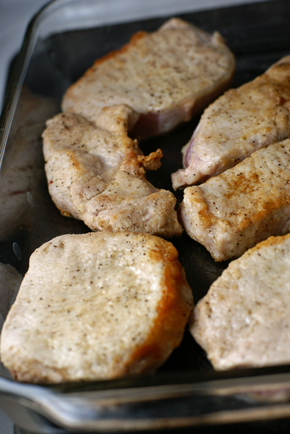 Place the flour and salt and pepper onto a plate or dish large enough to dip the pork chops. 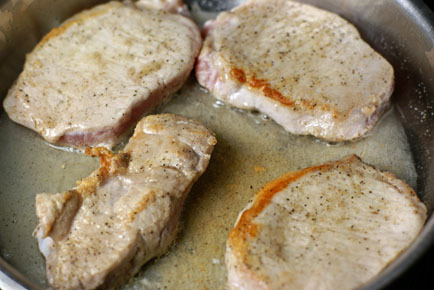 Coat each side of the pork chops with the flour mixture. 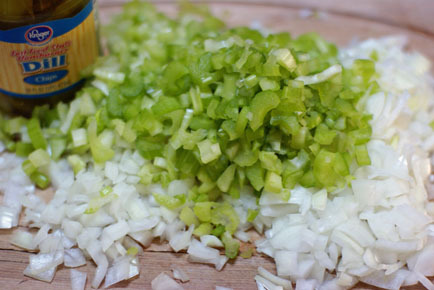 In a large mixing bowl, toss together the chopped onion, chopped celery, olive oil and pickle juice. Season with a little salt and pepper. Pour the mixture over top of the browned pork chops. 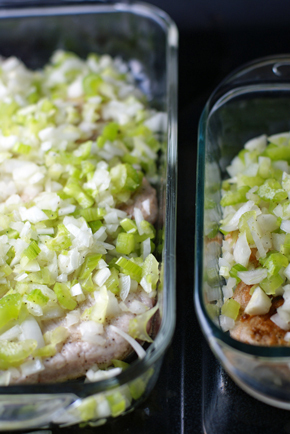 Bake at 350 for 30-35 minutes, or until pork chops are no longer pink in the middle. Prepare the rolls as directed on the package. 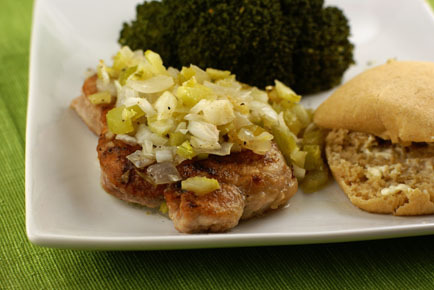 Serve Smothered Pork Chops with Steamed Broccoli and Dinner Rolls. This made enough for our family, our friends and there were leftovers. Would easily feed 8 adults! Those look great! 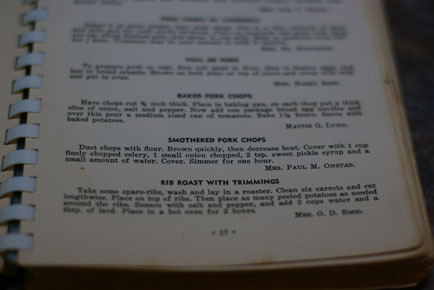 I remember doing a recipe that you covered pork chops with onions and a bit of ketchup and baked them in pickle juice, 1/2 cup or so. I remember liking those and am thinking I need to try these! Haven’t had pork chops in a while. Although you don’t specify the type of pickle, your photo shows a jar of dill pickles while the original recipe calls for sweet pickle syrup. Have you tried it both ways? Wouldn’t it be more tender if simmered covered per the recipe? Why the changes? I was wondering the same thing Mary was…which juice, sweet pickle juice or dill pickle juice??? The taste would be quite different. The recipe does look fairly easy and delicious, thanks for sharing. I enjoy vintage recipes. P. S. I think I will add some shredded cabbage to my smother ingredients, YUM! I made this tonight. Fabulous! I used juice from dill pickles. We will certainly have this again and often. Thank you for sharing. We make pork chops with a mushroom gravy. I’m definitely not a cook but even I can pull this one off. Salt and pepper on each side of the pork chops. Place in baking dish and cover with foil for 45 min. Remove from oven. Drain any drippings from the pan. Mix 1 can cream of mushroom soup with equal amount of milk. Season with cayenne pepper, salt and pepper. Pour over pork chops and cover with foil again. Bake for 20 more min. I’m guessing this could probably be crock-potted… I may try that. I have some celery that needs used up… going to go check to see if I have chops in my freezer! We aren’t really pickle fans in my household. What can I use instead? We’ve tried pickling other vegetables before and have had some success. You can get different pickling salts and solutions to use. Some that turned out good are cucumbers slightly pickled, zucchini, and beets. By pickling them they keep better under cooking than just using fresh veggies this way. As you know they break down and become mushy. Looked so good I am trying it out tonight. I used green onions out of my garden, otherwise did not deviate much from your original. Besides the sea salt and pepper I used a little pork seasoning on top of it. The left over flour mixture along with the juices left over from the celery mix I mixed together and poured over one of the dishes with the chops in them. We had too many to fit into one pan. We’ll see how that one turns out. I used dill pickle juice and I chopped a bunch of the pickles up and threw on top of the chops as well. Yummy! I made this for dinner tonight, yum! We had it with mashed potatoes and a tossed salad and bread rolls. It was very filling and we also have leftovers (family of 6). Two of my children said that with the pickles and the breaded porkchops (I used dill relish w/ its juice. ), it reminded them of Chic-fil-a. I’m taking that as compliment! Thank you for a delicious recipe.